Living in a new area which is like at its phase being developed? Duh! 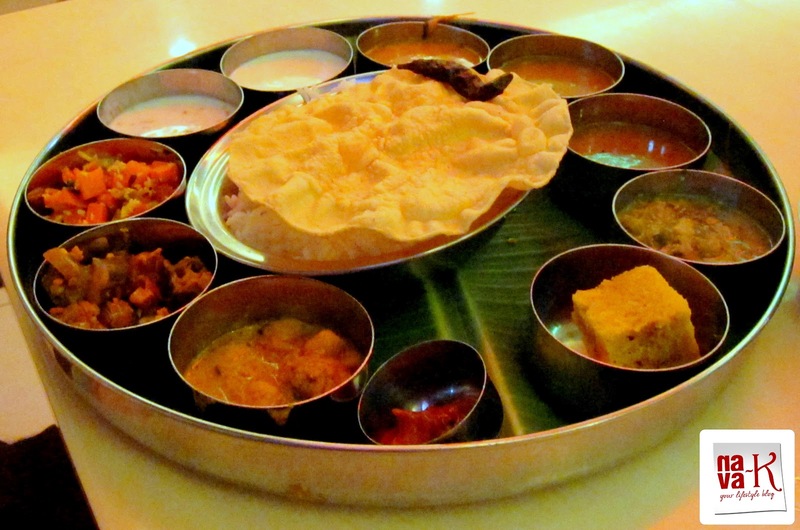 In fact, if you are talking about a decent Indian vegetarian meal, you don't have choices. 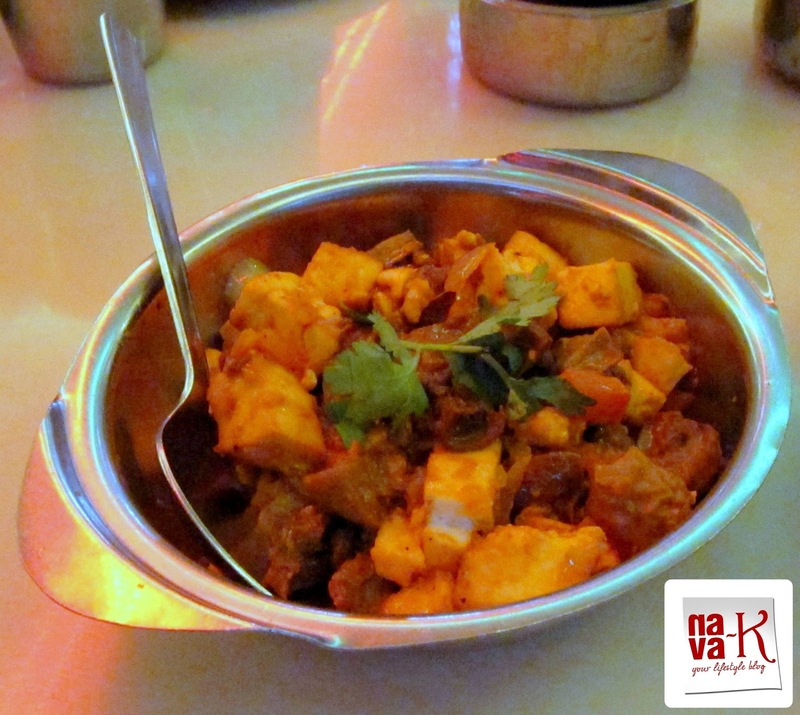 Unless we are talking about heading to the mamak eateries and then opting for the vegetarian dishes between the rest they offer. Otherwise? You gotto to drive out and sure we drove all the way to Restaurant Saravana Bhavan on this particular Saturday. Parking of course was super easy. Well, its a Saturday, I already told you? We parking just across and making our way in. Goodness gracious! Packed to almost back to back and if not for the table right at the back, the nearest to the kitchen, most probably, we would have ended up waiting for maybe 20 minutes or so? Having said that, amidst the busyness, service must be praised. Almost instantly in this air-conditioned and clean dining area. What did we order? My-my! What a spread on their menu. Options literally spilling over. Eventually, we had to order. We settled for Vegetarian Thali Set, Vegetarian Briyani, Paneer Masala, Masala Tea (2x) and Kesari. Dishes served within the next 10 minutes prior to us, of course, delighting in. Vegetarian Thali Set. Quite a sensational platter. Rice and papadam atop, plus 10 sides. Stir fried veggies, curries, pickle and two types of mooru/yogurt gravy, and a sweet. Absolutely a filling meal, in fact more than enough for a small eater and overall, must be praised. 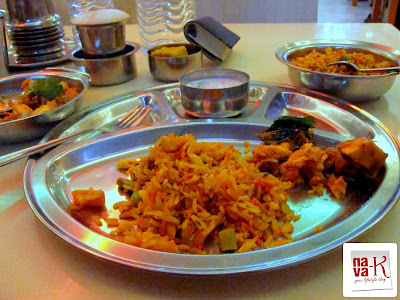 The traditional Indian cooking to a rice meal. 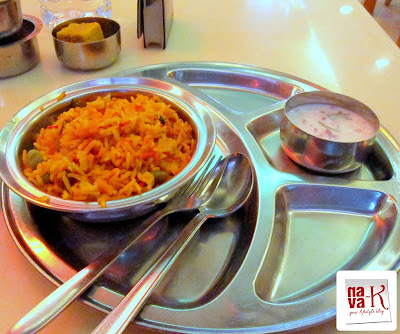 Vegetarian briyani paired alongside vegetable raita (carrot and cucumber in yogurt) and panner masala. Spices and all things nice. Tasty. I must vouch. Masala chai and kesari. 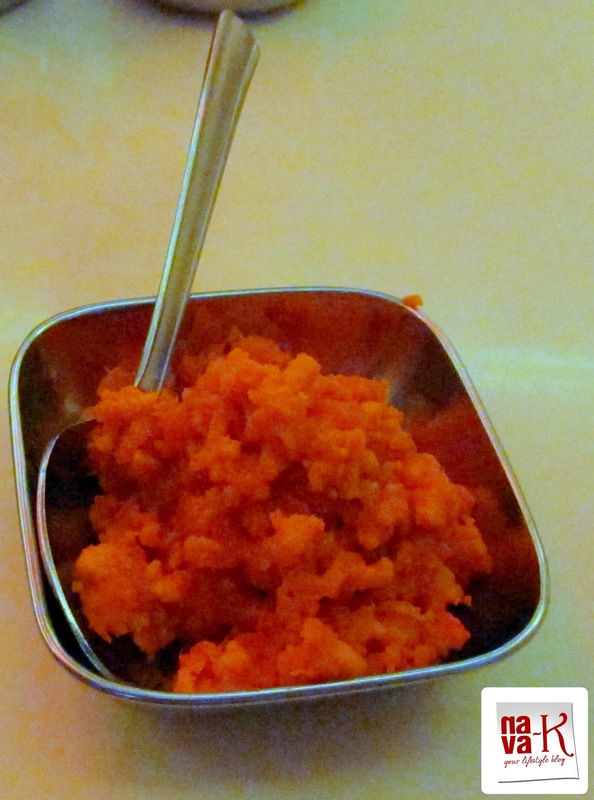 Masala chai definitely didn't let us down, but kesari. Overly loaded by sugar until I gave up after two spoons. 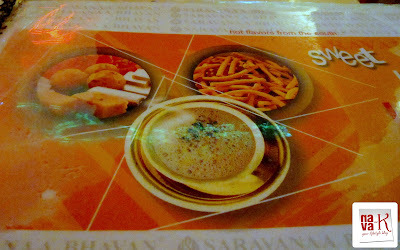 Restaurant Saravanaa Bhavan (RM45.00). I don't think you will be disappointed. Nava, looks like u're more into blogging now! Noticed the new header, logo & tabs. Wow! Love everything about it :) Great work, dear! Very tempting Indian food. I love Vegetarian food! The food looks so good! I can't believe I have been gone so long your blog design has changed a bit! Love the new look! Hi nava,thats a neat review on HSB...of course,top indian hotel with highest no of branches.. I am loving the look of that large, gorgeous papadam! 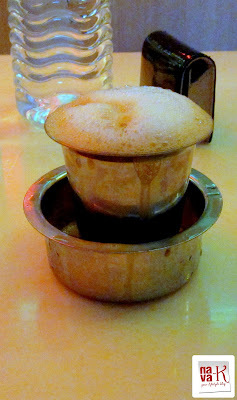 The masala tea looks original and delicious. Sometimes it really can be hard to decide on a good place to dine, but it looks as if you found a perfect one for what you were craving. The food does look delicious as well as healthy-definitely worth a second visit! Enjoy the weekend! Looks like a wonderful spot for a meatless meal! And I wish my taste buds didn't like sugar so much :/ Hope you're having wonderful weekend, my friend! Hmmmm I don't remember seeing this place when I drive pass Jalan Gasing every weekend. Hmmm..I must not be paying attention to the restaurants. 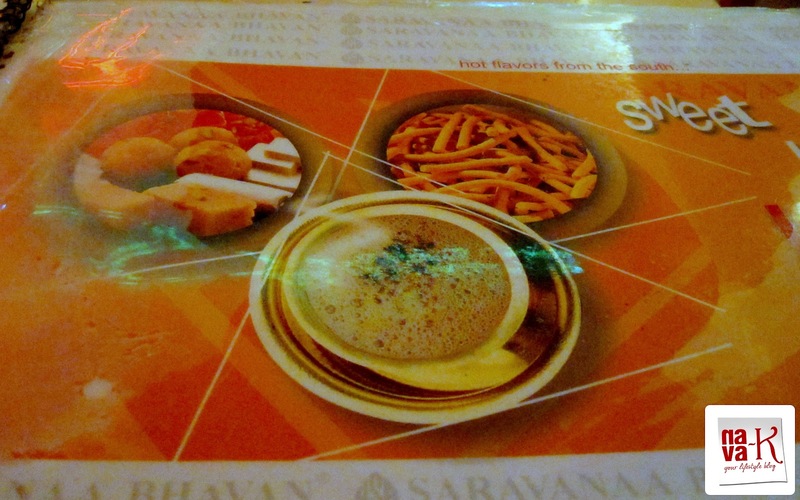 I had my lunch for a couple of days in Saravan Bhavan during my visit and I loved it, esp my kid.